A Christmas quiz with 40 questions. Some are obvious, some are odd, many can’t be Googled and a few are fiendish. By all means have a go and there’s a token prize for the winner but some of the questions are posed because the answers should set up some interesting discussion points. 1. Dressed in red and white he makes his way through the snow. It’s not Santa so name the famous Faema rider in the picture above. 3. 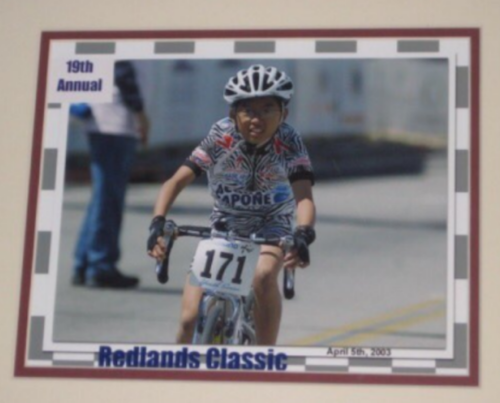 Can you name the rider below who went on to become a team manager? 4. Who won the UCI World Tour rankings? 5. Bahrain-Merida’s Luka Pibernik didn’t win anything or get a top-10 this year. What was he famous for instead? 6. Who was lanterne rouge in the Tour de France? 7. Name a new race on the pro calendar in 2017. 8. Name a race that vanished in 2017 (either not happening or held for the last time). 9. Which pro in the World Tour raced the most in 2017? 10. Who’s he (and why is he smiling)? 11. 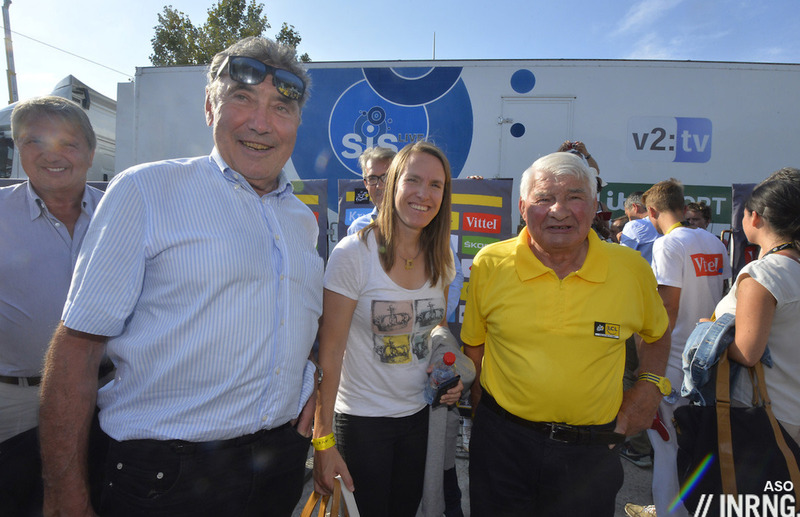 Eddy Merckx and Raymond Poulidor pose with ex-tennis player Justine Henin. Merckx won almost everything going and Poulidor was famous for being the runner up but name a significant race where Merckx finished second to Poulidor. 12. Name the future pro above and name the future pro below. 13. What’s the significance of the location featured in the image above? 14. Why can’t you have a summit finish atop a mountain pass? 15. What was the highest altitude for a stage finish in the World Tour? 16. What is significance of this statue pictured below? 18. Which country has enshrined in law that Milan-Sanremo must be broadcast on free-to-air TV? 20. Jarlinson Swamp, Stone Tower and Snowy Newcastle are possible literal translations into English of four World Tour rider names. What’s their real name? 21. “A property developer and organiser of boxing fights” was how L’Equipe described one new entrant into the sport of pro cycling in 1989. Who was this? 22. Name someone who did the dubbelslag in a race this year. 23. Are all pro races subject to the Extreme Weather Protocol? 24. What is the maximum number of days a year a World Tour rider should race per year? 25. If a stage race opens with a team time trial (like Tirreno-Adriatico) how is the starting order determined? 26. What is the daily allowance for a UCI Commissaire at a World Tour race? 27. What’s the minimum wage for a 32 year old male World Tour rider? 28. What’s the minimum wage for a women’s World Tour rider? 29. What does team sponsor Sunweb do? What is Cofidis’s line of business? Can you buy a Katusha? 30. Which has the larger annual budget, Team Sky or WADA? 31. You’re the mayor of a small city. What will cost you more to host, the “big start” of a grand tour or the UCI road cycling world championships? 33. Which current pro might this be? 35. Many pro riders have qualifications in other domains. Name the spring classics winner who spent time studying horticulture before turning pro? 36. Which Tour de France stage winner from last summer swapped a computing and information technology degree for the pro peloton? 37. Romain Bardet’s almost famous for his masters degree. Name an Ag2r La Mondiale team mate who has one too. 38. Can you name the Vuelta stage winner from this year who has a black belt in judo too? 39. The Four Days of Dunkirk actually lasts six days. Name another race with a fictitious label. 40. What was the first ever mountain pass climbed by the Tour de France? This is a quiz rather an email address harvesting attempt hidden behind some facile questions but it’s not easy and nor is typing up all the answers. I don’t expect many to try and answer all 40 questions but if you want to have a go or maybe readers collectively crowdsource their way together, feel free to leave your answers in the comments below and the deadline is midday Euro Time on Wednesday 27 December. 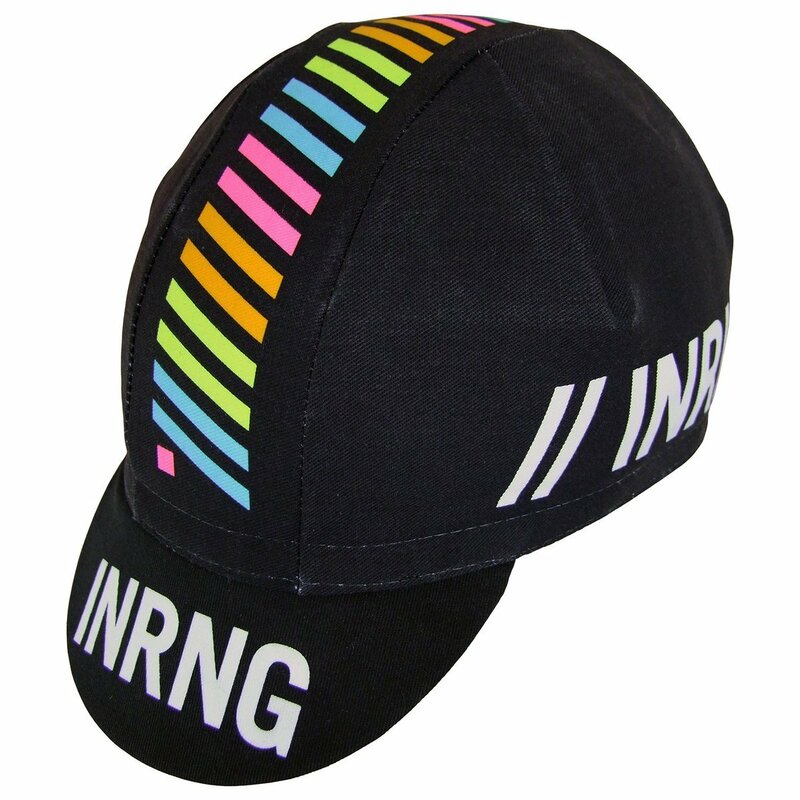 As an incentive the winner gets an INRNG supporter caps. The most correct answers wins and if there’s a tie then the first respondent to get there wins. All the best Inner Ring and readers / cyclists. Thanks for a lot of laughs, and above all enjoyment. I don’t know ANY of the answers! Mais sinon je vais m’y attaquer 😉 bon petit challenge. 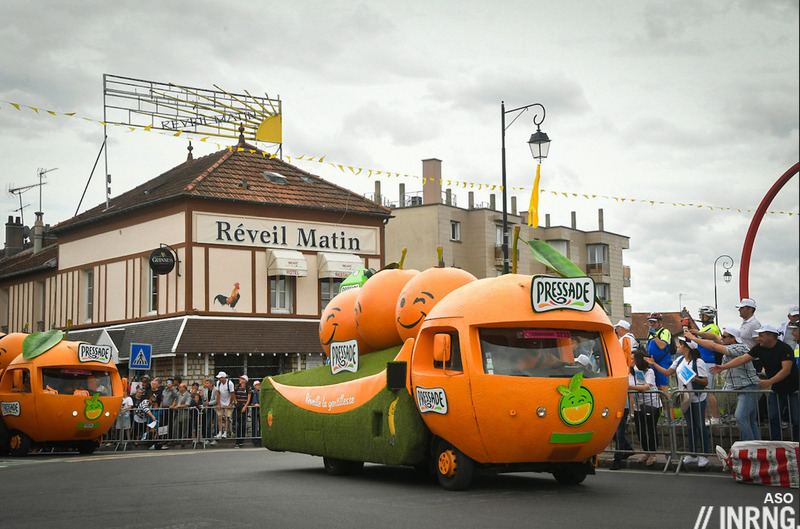 13 bis- C’est ici que le Tour de France a débuté, la première édition. 20- Jarlinson Pantano, Pierre Latour, Mikel Nieve ? 25- Un tirage au sort ? Pas eu le temps de tout faire..
14. Why can’t you have a summit finish on a mountain pass? By definition it’s not a summit, but a valley between two summits? 24. Max number of race days per year for a WT rider? 25. Rule 2.6.024 – The starting order of team time trial stages shall be the inverse order of the general team classification, to the exception of the leader’s team which starts last. Where no such classification exists, the starting order shall be determined by drawing lots. 29. Sunweb: Travel website. Cofidis: Loans (and other financial services). Katusha: Meaningless diminutive of Katherine. 31. €7M license fee for the Worlds (Bergen) plus another €8M in running costs, vs £3.5M in Grand Depart bid costs and about £10M in running costs (Yorkshire), vs Dusseldorf (€4.4M in total costs). So the Worlds cost more to buy the license. Ah nuts – that was me, not an Anon. A last-minute refresh to check if you’d fixed the duplicate-13s took away my details. You just spoilt it for me, I reckon I would have cracked it by Easter! 5. Thinking he won a stage in the Giro one lap too early. 12. Romain Bardet (left) and don’t know. 20. You mean three? Jarlinson Pantano, Pierre Latour and don’t know. 29. Provide internet. Credit system. No. 39. Paris-Roubaix (starts in Compiègne). 20. Jarlinson Pantano, ?, ? 10. President of Torino in 14th stage of Giro from Fausto Coppi’s hometown Castellana to Oropa. 14. Mountain passes are not summits. 15. La Vuelta. Alcalá la Real to Alto Hoya de la Mora, Sierra Nevada. 2510. 22. Warren Barguil. TDF stages 13 & 18. Extreme Weather Protocol when appropriate. 29. Cofidis- credits stuff. Sunweb travel stuff. Katusha a Russian rocket launcher from WWII. Don’t think they sell it. 39. Amstel Gold Race is not a race for gold Paris – Roubaix does not start from Paris. 33. Fish rider: Jelle Wallays. Fish: Walleye,Freshwater, Columbia river. 20. Third name is Yuki Arashiro I think. 16. It’s the statue on top of the fearsome Alto de los Machucos climb. It’s a Vasiego cow, if I’m not mistaken. 28. There isn’t a minimum wage. 29. Holidays, bank, and yes, you can buy a Katusha iirc. And 38 of course has to be 39. Stop the clock. Isn’t it three days of de panne, which takes place over four days. Although the others e.g. Paris-Roubaix do not run the same path any longer, they did used to start in the named location at some point. 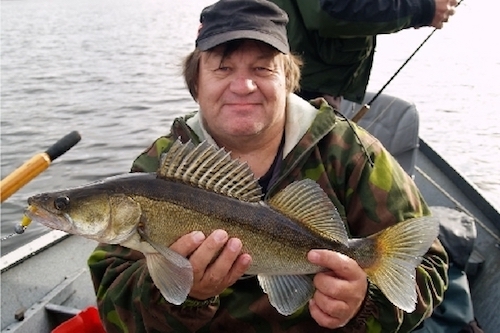 33 is Kyle Zander – spent too much time fishing instead of studying in my youth. Thoroughly enjoyed this, thank you! 10. Urbano Cairo – I can only imagine he’s happy to be away from football, where his arch-rivals would beat his club’s cherished Serie A record a day later. 14. A lack of space, not to mention the logistical issues with closing a route ‘to’ somewhere..? 15. Stage 7 of the Tour de Suisse, the Rettenbach Glacier road. 16. It’s at the end of Los Machucos, the madly-steep climb in this year’s Vuelta. 23. Only WorldTour and HC events require it. 28. No minimum stipulated although local law will apply. 29. Sunweb are a tour operator; Cofidis offers consumer loans; Katusha (‘Katy’) comes from the folk song. You can buy records of the song, but not the music rights I daresay, nor of course anybody with the name. It isn’t the rocket launcher. 39. Paris-Roubaix, Paris-Tours, Paris-Nice and Paris-Camembert don’t start in Paris (at least not in 2017). Isn’t number 14 the fact that a pass is the lowest point on which you can go over a mountain, while a summit is the highest point on the mountain. So by its very nature you’ll never have a summit finish. Only one I got (in spite of putting in a full 4 minutes of work, so overwhelmed was I) was #21, only because I was there, and because it so neatly matches our current president’s only skills. 10. Urbano Cairo – it’s taken during his first Giro as chairman of RCS, the owners of the race. 14. Because it would cause too much traffic problems and there is not enough parking space. 16. Monument for the Pasiega cow, on top of Los Machucos, where stage 17 of the Vuelta finished (and where Froome got breathing problems which he solved the next day). 17. Dutch TV: 20 minutes per day, over 25 days: 8 hours and 20 minutes>> 10 hours. 20. Jarlinson Pantano, Piere Latour, Nieve; 4th Newcastle? 24. 85, but they are allowed after explanation (45 riders raced more than 85 days). 29. Sunweb: Holidays; Cofidis: Bank; Katusha: I can’t, since civilians aren’t allowed to have rocket launchers. 1. Charly Gaul during Merano-Monte Bondone stage at Il Giro 1956. 10. Urbano Cairo is the Chairman of RCS MediaGroup, Giro d’Italia organizer, and Torino FC. He gives the departure of the stage at Castellania, Fausto Coppi’s birthplace. 11. 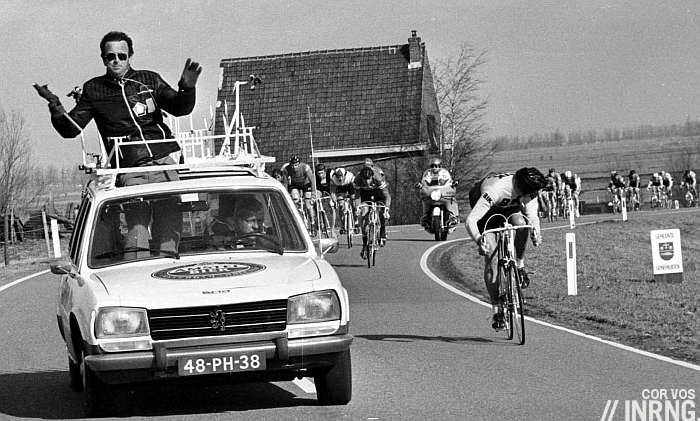 Paris-Nice 1972. Poulidor did a dubbelslag by winning the final time trial and finishing six seconds ahead of Merckx in the GC. 16. 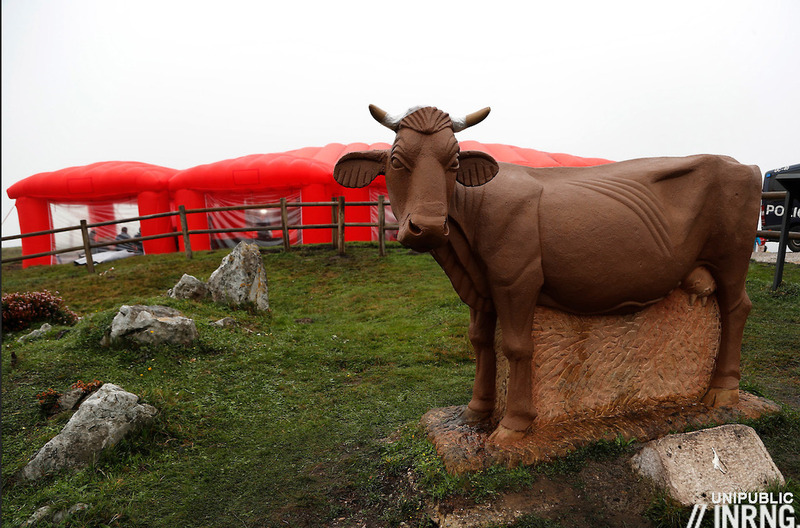 It is the Monument to the Pasiega Cow, a local breed, in Alto de los Machucos, finish line of stage 17 of La Vuelta. 17. I estimate it was 20 hours because the last 20 kilometers of each stage were broadcast live. 24. The maximum theoretical number of days of competition depends on the calendar. Really, the annual number of competition days and their planning are the team’s responsibility, taking into account the UCI regulations. 25. The starting order shall be determined by drawing lots. Cofidis (COmpagnie FInancière de DIStribution) is specialized in the consumer credit business. 37. Alexis Vuillermoz : Master Management Métiers de la banque et de l’assurance, IAE Perpignan. Game over. I think Sonja knows her stuff. Lots of good picks, impressive and more than I thought but nobody has got 100% yet. Answers tomorrow (Thursday). Previous post: The Moment The Race Was Sold?